Ukraine's Acting President Oleksandr Turchynov has written a letter to Justice Minister Pavlo Petrenko asking him to examine whether the Communist Party of Ukraine was involved in activities aimed at violating the country's sovereignty and territorial integrity. 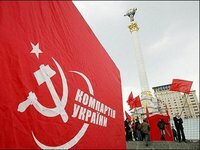 "I hereby ask the Ukrainian Justice Ministry to examine whether the Communist Party of Ukraine was involved in the actions aimed at violating the sovereignty and territorial integrity or our state, undermining its security, illegal takeover of government buildings, and to immediately take statutory measures to ban the Communist Party of Ukraine," according to the letter which was posted on the acting president's website on Monday. Recently the party and its political position have been "frankly unconstitutional," Turchynov said. In particular, data analysis from the Ukrainian Security Service suggests that certain Communist leaders and activists in the southeastern regions of Ukraine provide "not only verbal support for terrorists but also practical, technical and material assistance to representatives of the so-called Donetsk and Luhansk people's republics," the acting president said.